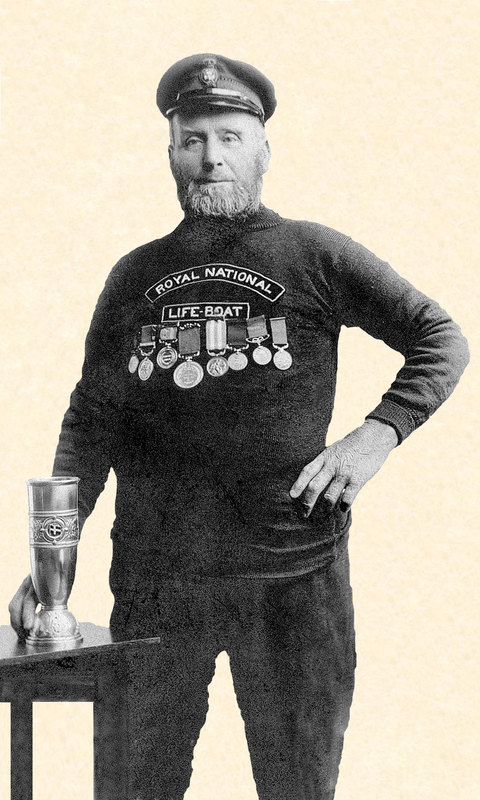 Born at Cullercoats in 1849, Robert Smith was connected with the RNLI for fifty years. 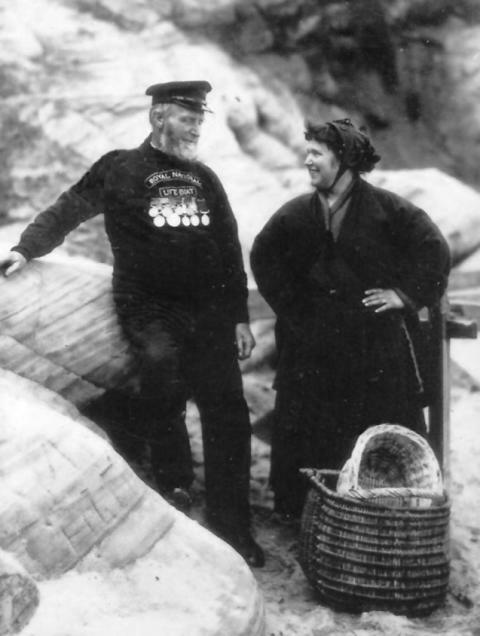 He was already an established lifeboatman of long experience when, in 1909, he was appointed Second Coxswain of the Tynemouth Lifeboat. The following year he was appointed Coxswain, holding the post through the treacherous years of the War. 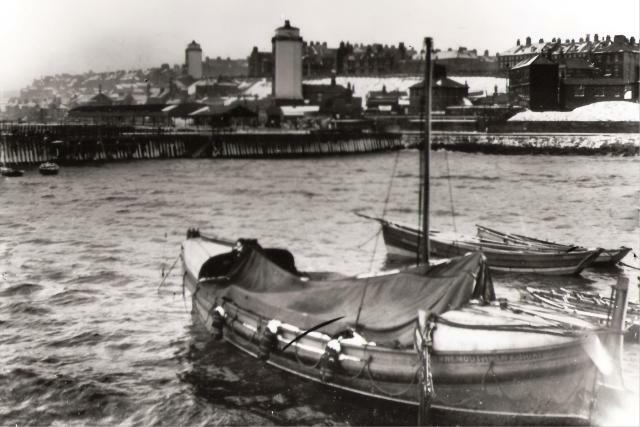 Some years before Robert Smith became Second Coxswain, the first lifeboat to be converted to motor power by the Institution was stationed at Tynemouth. This was replaced, the year after he became Coxswain, by the motor lifeboat Henry Vernon. Robert Smith could therefore be considered as one of the pioneers in the use of the motor lifeboat which went on to greatly revolutionise the service. The Henry Vernon, was built in 1911 and stationed at Tynemouth until 1918, before being transferred to Sunderland, where she remained until 1935, during her service to the RNLI she rescued 266 lives. The lifeboat was replaced at Sunderland by the 46 feet Watson cabin type lifeboat Edward and Isabella Irwin. Sunderland has had a lifeboat station since 1825 but was taken over by the Institution in 1865. 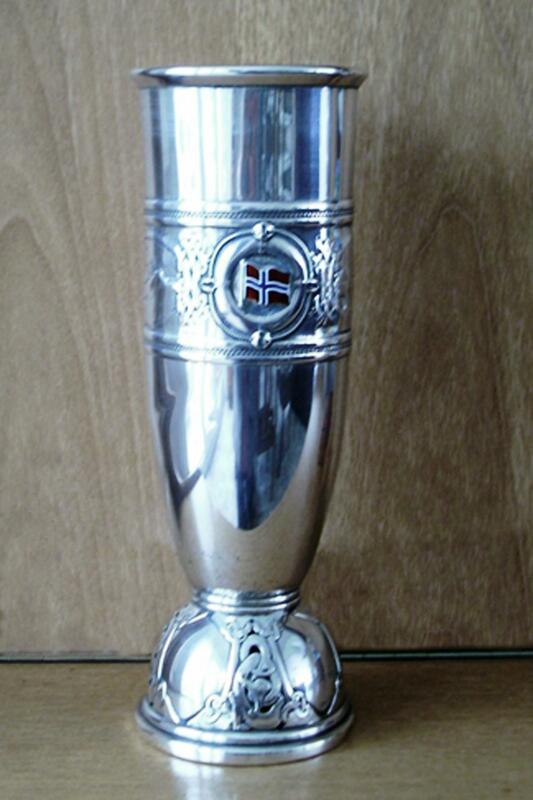 In 1913, Robert Smith and Major Burton, R.E., the Honorary Superintendent of the Tynemouth motor lifeboat, had each been awarded the Silver Medal for their gallantry in the service to the S.S. Dunelm, of Sunderland, one of the most daring services in the history of the lifeboat service off the Tynemouth coastline. The Dunelm had stranded quite close to Blyth east pier, at low water but in such a position that the Blyth Lifeboat could not reach her. The Tynemouth motor lifeboat situated ten miles away was summoned and Major Burton and Coxswain Smith gallantly brought the lifeboat to Blyth, in a roaring S.E. gale with a very heavy sea, and rescued the shipwrecked men. It was in the Henry Vernon that Robert Smith performed one of his greatest services, the rescue of fifty survivors from the wrecked hospital ship Rohilla in 1914 for which his name will be chiefly remembered. The epic story of the service to the Rohilla has been told many times. Here it is only necessary to recall that another of the great lifeboat Coxswains of the North East Coast "Thomas Langlands" had twice succeeded in reaching the wreck in the Whitby No. 2 Lifeboat and had rescued thirty five men and women. The lifeboat being so badly damaged was unfit for further service, and after every effort of the other pulling lifeboats to reach the wreck had failed, the Tynemouth motor lifeboat was summoned as the last hope of saving those who still clung perilously to the wreck. Coxswain Smith and Major Burton navigated the boat safely through a hazardous journey from Tynemouth to Whitby in the wild night storm. Early next morning she rescued the final fifty men on the wreck, who had survived their terrible ordeal of fifty hours. For that service, Robert Smith, Major Burton and Thomas Langlands were awarded the Gold Medal, the highest honour presented by the RNLI and is only given for conspicuous courage and devotion. Robert Smith held a number of other decorations and awards. He was one of the eight Gold Medallists of the Institution alive when its Centenary was celebrated in 1924. He attended the Centenary dinner at which the Prince of Wales presided, and, with the other Gold Medallists, was received by the King at Buckingham Palace, and decorated with the Medal of the Order of the British Empire. It was to him, so one of the other Gold Medallists said afterwards, that the King talked most, asking him about all his medals. One of the most prolific photographs Robert Smith is seen with is that (top left), after he was awarded a unique piece of silver plate (left) by H.M. the King of Norway. Silver Medals and diplomas were also conferred on other members of the crew. Silver Medals and diplomas were also sent for the crew of the private Lifeboat Tom Perry. The rewards given by His Majesty were in recognition of the splendid services rendered to the Norwegian steamer Bessheim, which was wrecked at Tynemouth in a fierce easterly gale on the 18th November, 1916. The vessel was bound to Norway with a general cargo, and carried seventy eight passengers and a crew of thirty three including seven stewardesses. At the time of the rescue a gale was raging, but fortunately all those on board were saved without mishap. Full particulars of the service were given in the lifeboat Journal for February, 1917. 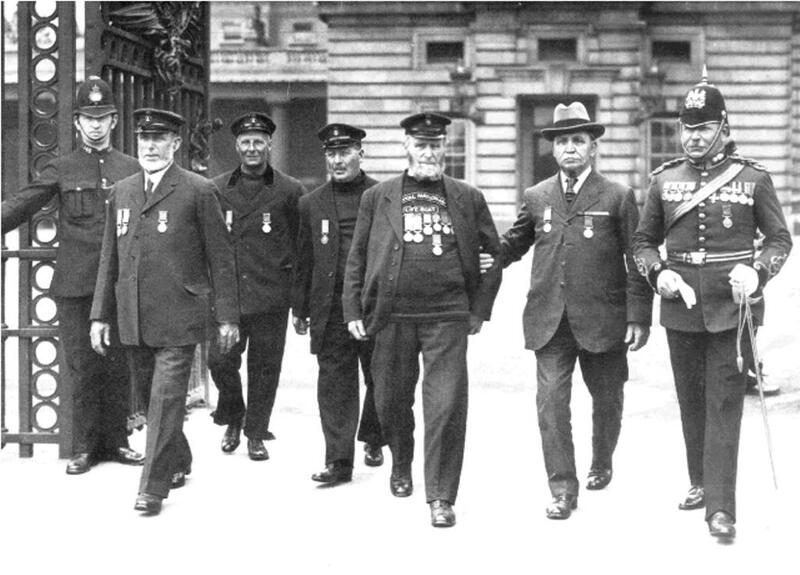 Robert Smith finally retired in March 1920, aged seventy one with his sight failing in 1924. After becoming one of the most famous lifeboat skippers in the country, Coxswain Robert Smith died on 30th October 1927, thirteen years to the day after the tragedy of the Rohilla in which his contribution was monumental. He left behind him a great record and a name which will be remembered with honour and gratitude so long as the lifeboat Service itself is remembered. No man more gallantly and more honourably carried on the great traditions of the Service off the Tynemouth coastline, where the first permanent lifeboat Station was established and where men and women have shown great gallantry in the work of saving life from shipwreck. This last photograph shows Robert Smith with his daughter Hilda. The Henry Vernon's tragic end after its release from the RNLI can be found here and I have just added a more detailed transcript related to Robert Smith.